The Imperial Harem, the private pleasure palace of the Sultans, is the most well-known aspect of Ottoman royal life. But what is the secret behind its fame? Why has the Ottoman Harem persisted so indelibly in popular culture? Maybe it’s the concept of hundreds of beautiful concubines whose sole mission in life is to provide pleasure to a single man, which has proven so timeless and fascinating. Or perhaps it’s the Harem’s fabulous tile-work. Hmm… yeah, that’s a toss-up. The Imperial Harem of Topkapı Palace is amazing. Even the very fact of its existence is audacious. Here, in a sumptuously decorated labyrinth of 400 rooms, lived the Sultan’s slaves, concubines and wives, guarded over by a cadre of eunuchs. Only these passionless de-manned men were considered “safe” enough to protect the Sultan’s private bevy of beauties. It may have been an extravagant place to live, but the majority of women who lived inside were slaves, kidnapped from far-off lands. And the Harem was also called the “Golden Cage”. Known for their good looks and femininity, Circassian girls were especially prized, but the imprisoned ladies came from across Europe and the Middle East. Toward the end of the Ottoman Empire, as the ruling class descended into ever more debauchery, there were up to 800 women living in the Harem. 800… and the Sultan had his pick of the lot! When he got bored with one, he’d just move on to the next. Should one find herself pregnant, she would immediately gain in status. The “favorites” were allowed into exclusive quarters and enjoyed special privileges. An especially lovely girl could even aspire to become one of the Sultan’s kadıns, or wives, in which case she’d find herself nearly at the very top of the Harem hierarchy, with access to slaves of her own. The top dog of the Harem, though, was traditionally the Valide Sultan: the mother of the Sultan. She not only reigned over the Harem, but was often the most powerful person in the entire empire, depending upon how much interest her son showed in his job. Roxelana, the wife of Süleyman the Magnificent, was the first woman to rule the Ottoman Empire from the Harem. Her son, Selim the Sot, was given to wild orgies and drinking, leaving his mother to manage affairs as she saw fit. 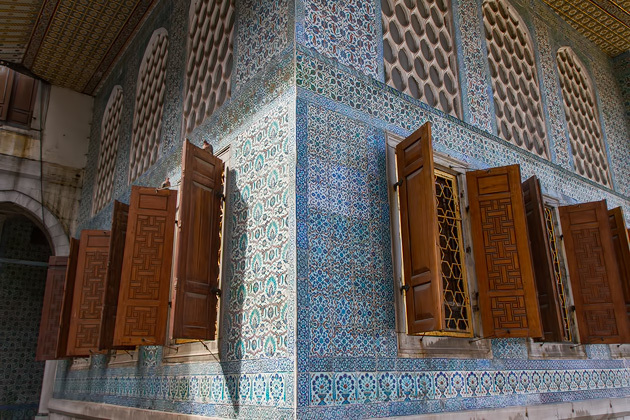 Today, you can visit the Harem after you’ve entered Topkapı Palace. It costs extra, which seems egregious considering that the palace is already quite expensive, and you have to wait in yet another ticket line. But the additional time and expense are worth it. The women of the Harem may have been slaves, but they lived in true luxury. The rooms are resplendent, with colorful Iznik tiles decorating many of the walls, and gorgeous furniture on which to while away the days. You can’t get into nearly all the rooms, but you can see some of the most impressive, including the Sultan’s bedroom, the Courtyard of the Eunuchs and the apartments of the Queen Mother. Leading straight through the Harem is a path called the Golden Road, so named because the Sultan would walk along it on festive days, throwing golden coins on the ground for his concubines to gather up.